After a long three month break from blogging and finishing up my last published restaurant reviews for the paper, I’M BACK! The initial purpose of me starting a blog was to be myself, share what I love to do, and drop the occasional F bomb. Although writing for the paper was the best job ever and most amazing experience, I am ready to use everything I learned and experienced to bring yummy recipes, restaurant reviews, tips and techniques. Like everyone else, I don’t have time to make 4 course gourmet meals every day so the most important thing to me is making simple recipes for regular people with hectic lives. Cooking does not have to be a intricate multi-step process all the time. I hope to bring a little ease to the notion that cooking all the time is expensive or takes forever. As you get more comfortable with cooking and become familiar with flavors you like, you can begin tweaking recipes and adding or taking away what you don’t care for. I almost never follow a recipe because I am comfortable enough with getting creative so just give yourself time! 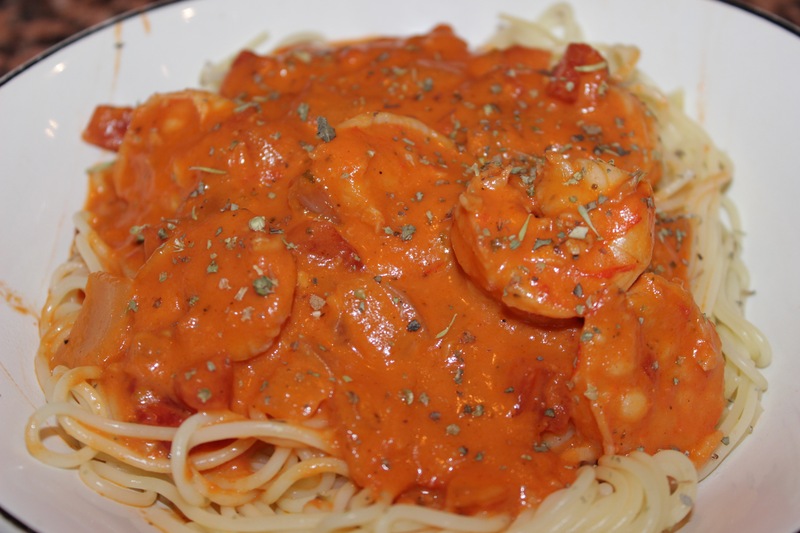 Okay, it was tough to pick what recipe to share for my first day back but I just had to share my favorite shrimp pasta alla vodka. Out of all the tasty things I have been experimenting with the past couple of weeks, this was by far my favorite. I have ordered this dish at restaurants numerous times but never tried making it until I thought about just how simple it is to make. This dish takes about 30 minutes to make and can be devoured on a week night or special occasion. The hardest decision at a restaurant is deciding whether I want a tomato based sauce or cream sauce. So naturally, vodka sauce is the best of both worlds with both tomato and cream and a hint of alcohol. After way too many drunken nights off vodka, I couldn’t dare put it in the recipe so I replaced it was my absolute favorite white wine. You don’t need a super fancy bottle because it will become reduced in the sauce but it adds a perfect distinct taste to the rich sauce. 1. First things first. Start cooking your pasta in a pot of boiling and SALTED water. It is so important to salt your pasta water for flavor purposes. Also, rinse your pasta before putting it into the pot to rinse of some of the starch off. Cook according to the box instructions. 2. 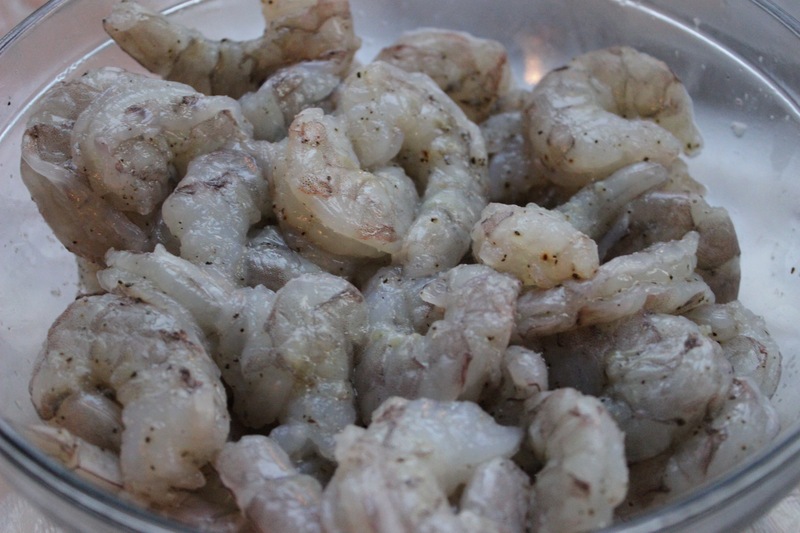 For this recipe I bought a pound and a half of raw shrimp from the local fish market and cleaned and deveined it myself but there is absolutely no problem in buying a bag of frozen raw shrimp from any supermarket just make sure to take the tails off first! For beginnning cooks, raw shrimp is gray and cooked shrimp is pink so look for the frozen gray shrimp and not the ones that are already cooked. 3. In a large skillet, melt 2 tbsp of butter on medium high heat. Be careful to not burn the butter or you’ll have a hot mess! Once its melted, add your diced onions and minced garlic. 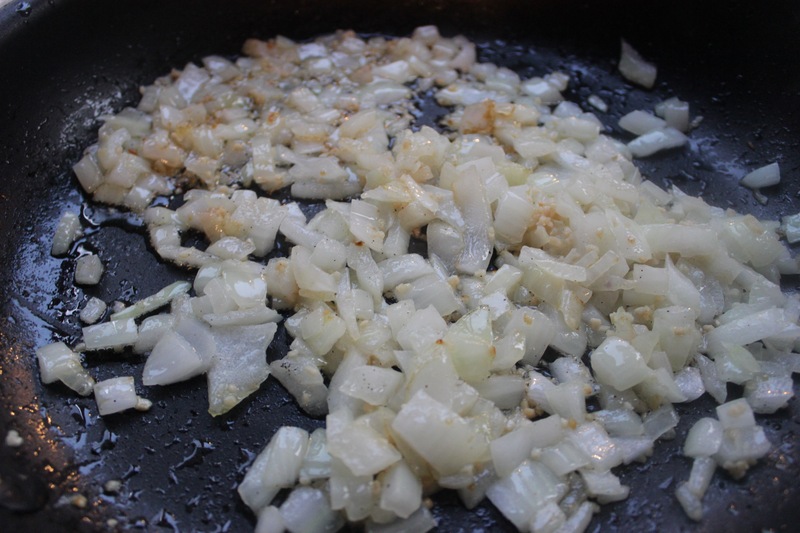 Sautee the onions until they are soft and translucent and lower the heat to medium. 4. Once onions are cooked and slightly brown, add the crushed tomatoes, cream, and wine. 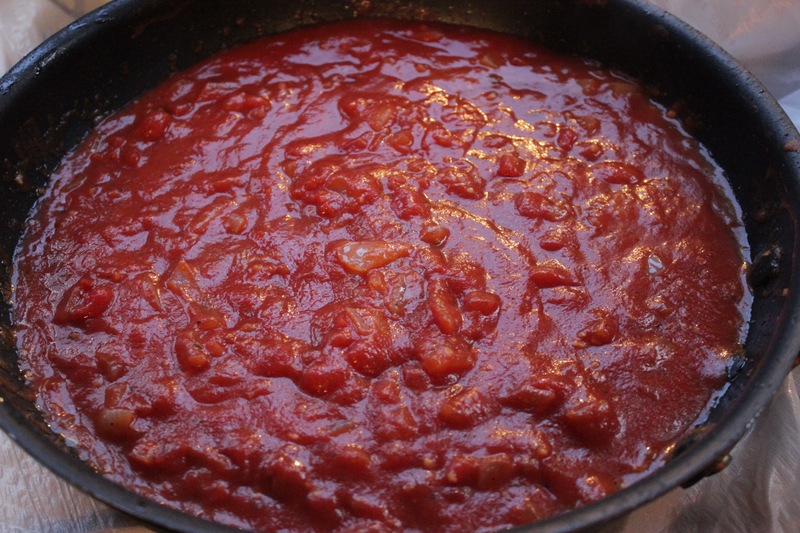 Increase the heat to bring the sauce to a simmer then lower to maintain a simmer. We don’t want to burn the sauce so be aware of heat settings. 5. 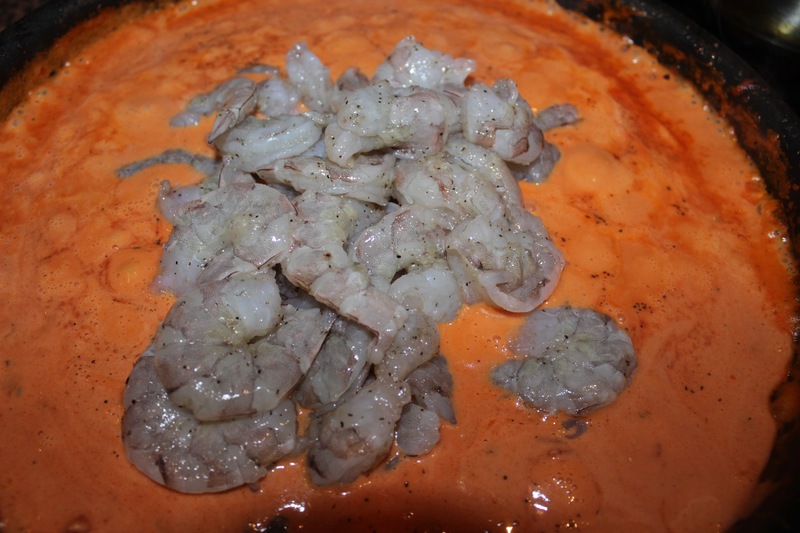 After you have mixed the sauce and all of the flavors are nicely incorporated, let cook for about 5 minutes then add your shrimp. 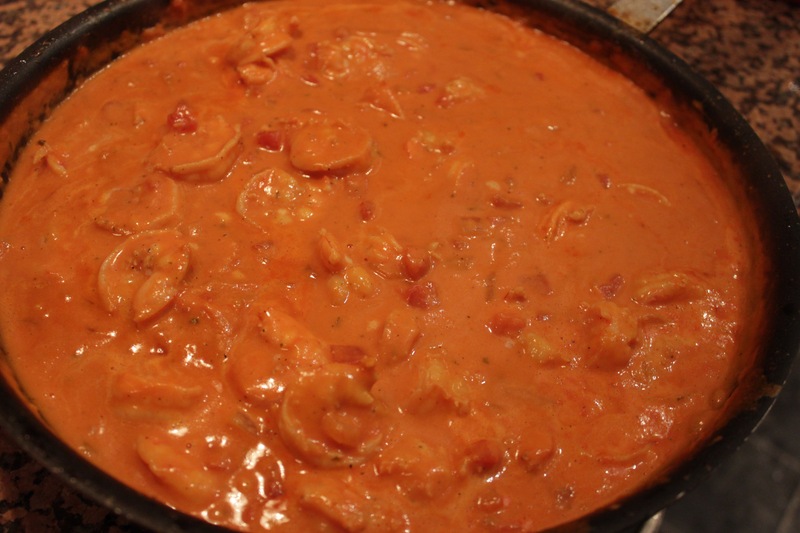 Shrimp cooks extremely fast so once you drop them into the sauce they will be done in 5-7 minutes. They will no longer be gray and a light pink so scoop one out after 5 minutes to check. Once they are cooked fully, add a teaspoon of salt and a teaspoon of ground black pepper to the sauce and turn the heat off. At this time our pasta should be done so you can drain it and get ready to serve! 6. Now how easy was that? Easy! At this point your kitchen should smell like heaven. You can either toss your pasta in the sauce or serve separately like I did. Either way is just fine because it won’t be plated for long. Garnish with some fresh oregano, basil or parsley.